She’s a powerful channel for the eloquent transmission of higher frequencies – a bonafide selectress on a mission to connect the physical and spiritual realms through the mystique of music. Robin Triskele knows her stuff. The 20 years she’s dedicated to underground dance music culture is testament to that fact. With a fearless curiosity, the artist has explored the depths of electronic dance music as she moves you seamlessly with an impressive collection through Psydub, EDM, Bass Music, Psychedelic Glitch, intelligent DnB and other eclectic downbeat forms of electronica.Robin has also recently formed a dub techno DJ/Live collaboration performing with Gabriel Le Mar (aka Saafi Brothers) called Synergy Dub. With her positive colourful, engaging spirit, she connects with the light frequencies of sound, projecting a playful energy from the decks to the floor. She consciously connects to the music to spread a positive vibration across the crowd. 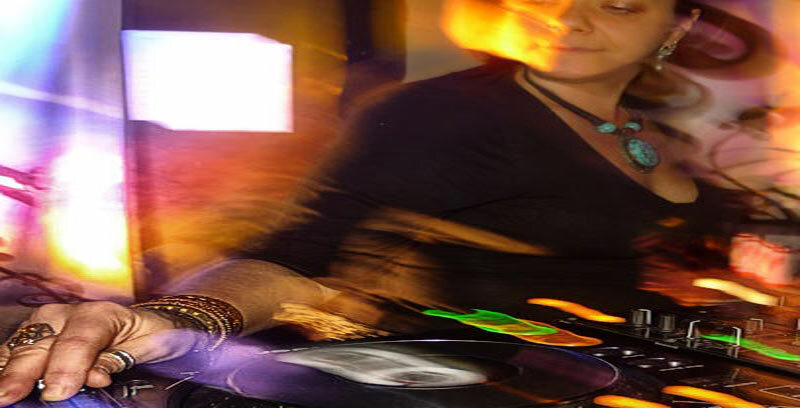 Always smiling, forever passionate, Robin will feed you the tastiest morsels of music with her funk-driven, quirky approach when sharing the best of electronica. From managing stages to coordinating line-ups, the artist has made a long-term commitment to events such as Tribal Gathering (Panama), Sonica (Italy), Psy-Fi (Netherlands). Kosmos (Finland) and Space Mountain (Spain) held at the legendary producer Youths’ Space Mountain studios.With plenty of passion for good quality music production, Robin launched her label, Triskele Music in 2014. She continues to inspire like-minded souls with her original style, playing top quality sounds to music lovers everywhere. With her vibrant spirit, she’s captivated crowds and the attention of many well-respected music professionals, sharing the stage with the likes of Tripswitch, Kaya Project, Pitch Black, Banco de Gaia, Ozric Tentacles, The Orb, Gabriel Le Mar, Bluetech, Youth, Solar Fields, Juno Reactor, Gaudi, International Observer, Mixmaster Morris, Entheogenic and numerous other widely respected artists.